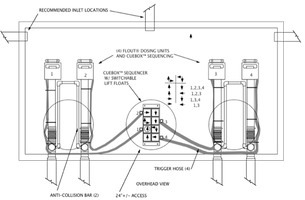 A failed siphon was replaced by four Flouts sequenced by a Cuebox. Only two Flouts would be used to feed two new fields. The other two Flouts would be connected to new disposal fields in the future and “turned on” as needed. 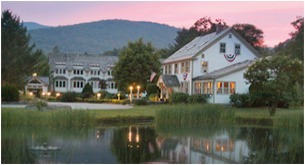 This beautiful resort in the Green Mountains of Vermont had a special design request. How could a failed siphon and disposal field be replaced by two new fields and a pair of alternating Flouts AND be ready to serve a third and fourth field at later dates? A special feature was added (now standard) to a four outlet Cuebox that would allow the first two Flouts to cycle while ignoring the other two. The other Flouts always float, never discharging. 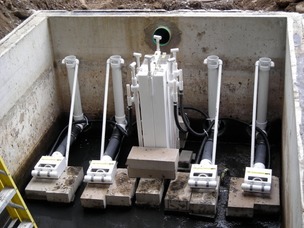 When the third field is built, a lift float in the Cuebox is easily rotated 90º to “turn on” the third field. Rotating another lift float will turn on field four when ready! Learn about CueBox switching. This is a 20 inch drawdown system. The Cuebox is anchored with solid concrete blocks. The outlets of the chamber are 4 inches off the floor so the Flouts are shimmed up with 4 inch blocks also.The small angled pipes between the pairs of Flouts are “drift bars” that prevent the Flouts from drifting into each other. The black hoses are the “trigger tubes” which carry liquid to the selected Flout, sinking it.